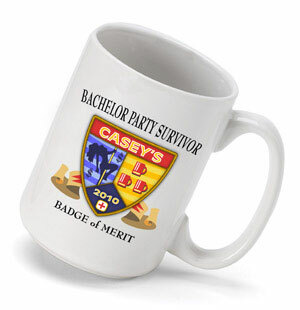 Award your bachelor party attendees or groomsmen with this hilarious mug, offering a merit badge for making it through that famous pre-wedding ritual. The colorful insignia includes all the vices of a traditional bachelor party and features the name of the groom and year of the wedding. Great gift for the groom, too! Holds 15 ounces. Personalize with groom's name and party year. Please note that we will add an 's after the first name you enter. Mugs are dishwasher and microwave safe.